Acording to the California wild rice commision, Wild rice (also called Canada rice, Indian rice, and water oats) is not really a rice after all, but instead the seed of a aquatic species of grasses forming the genus Zizania, and the grain which can be harvested from them. The grain was historically gathered and eaten in both North America and China. While it is now something of a delicacy in North America, the grain is eaten less in China,where the plant's stem is used as a vegetable. Because of its nutritional value and taste, wild rice increased in popularity in the late 20th century, and commercial cultivation began in the US and Canada to supply the increased demand. In the US the main producers are California and Minnesota (where it is the official state grain) and it is mainly cultivated in paddy fields. In Canada, it is usually harvested from natural bodies of water; the largest producer is the province of Saskatchewan. 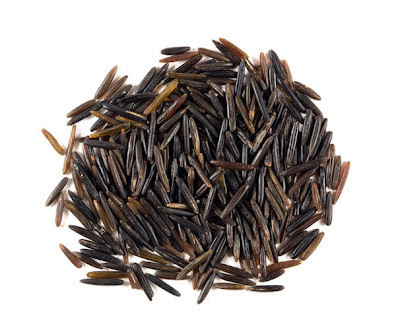 Wild rice is also produced in Hungary and Australia. 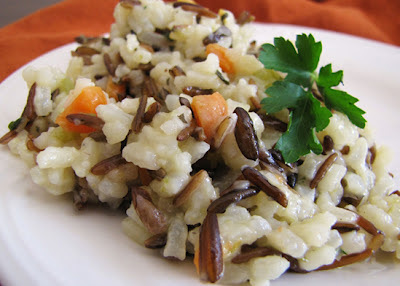 Full of nutrition, wild rice is high in protein, the amino acid lysine and dietary fiber, and low in fat. Like true rice, it does not contain gluten. It is also a good source of certain minerals and B vitamins. According to Self's online NutritionData, 1 cup of cooked wild rice would provide 5% or more of the daily value of thiamin, riboflavin, iron, and potassium; 10% or more of the daily value of niacin, b6, folate, magnesium, phosphorus; 15% of zinc; and over 20% of manganese. So now the big question that scares many a potential menu is how to cook it. While it may sound imposing, cooking wild rice is rather a simple endeavor. Wild rice usually requires more time to cook than regular rice. Undercooked wild rice has a hard texture and is difficult to chew. It often is beneficial to soak the grain for several hours or even overnight prior to cooking. Wild rice that is cooked perfectly consists of tender chewy grains that are butterflied, well rounded, and plump. Many people prefer wild rice grains that are only slightly split with a texture that is firm and chewy. The cooking time may vary widely depending on the texture desired and the type of wild rice that is used (wild rice that is lighter in color usually cooks in less time than darker varieties). Although wild rice may be expensive, it expands to three to four times its original size when it is cooked, so one pound of wild rice is enough to provide up to thirty-five servings. Wild rice is served as a tasty side dish or it is often used as an ingredient for soups and casseroles. A small quantity added to steamed vegetables or tossed into salads provides flavor and texture, and it is one of the best accompaniments for poultry and fish. Bring 6 cups water to a boil. Add 1 tsp. salt and 1 cup wild rice. Bring back to a boil before reducing heat to maintain a low boil. Cook until rice is tender, about 45 minutes. Drain in a sieve or fine-mesh colander. Boiled wild rice tends to have tender, but intact kernels. Put the wild rice in a saucepan. Add the water and raisins and cook over medium heat for 1 hour, or until the rice is tender. Drain. Saute the onions and celery (or fennel bulb) in the oil until tender. Add the cranberries, orange rind, thyme, and rice. Stuff into two cornish hens or a 3-pound chicken, or use with turkey breast. Bake in a 350 degree oven for 1 hour or until the poultry is done.